Olympic’s Wire Shelving can change as quickly as your needs change. 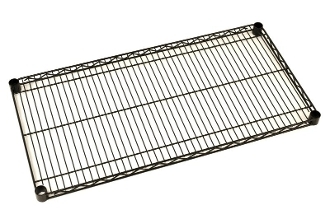 The open wire design of these carbon-steel shelves minimizes dust accumulation and allows a free circulation of air, greater visibility of stored items and greater light penetration. Shelf wires run front to back, allowing you to slide items on and off shelves smoothly. Shelves can be loaded or unloaded easily from all sides. This open construction allows use of maximum storage space of a cube. Shelves can be adjusted in 1” (25mm) increments along the entire length of the posts. (Posts must be ordered separately). The posts have circular grooves at 1” (25mm) intervals. A tapered split sleeve snaps together around each post. Tapered openings in the shelf corners slide over the tapered split sleeves providing a positive lock. Shelving units may be assembled in minutes without the use of any special tools. These black powder coated finished shelves are available in a wide variety of sizes. One order equals (1) shelf. NSF LISTED. Load Capacity: Up to 48" (1220mm) length = 800 lbs. (363kg), evenly distributed. 54"-72" (1829mm) length = 600 lbs. (272kg) evenly distributed. Copyright © 2018-2019 Olympic Shelving Products. All rights reserved.